The Seattle Department of Transportation has a new plan for its $930 million levy — the largest in city history — which promised more than it could deliver before voters approved it in 2015. Plans for street paving, bus routes and bike lanes all got big adjustments. You’re getting the new sidewalks that were promised. And the safety improvements in school zones, along with bridge repairs, seismic retrofits and spot fixes to help trucks and freight move through the city. But you’re not getting all the miles of repaved streets that were listed in the Move Seattle levy. And instead of seven new RapidRide bus lines, three, maybe four, will be built, with lesser improvements to the other promised lines. And as for ever-contentious bike lanes? Maybe half the miles that were promised are now expected, although it’s still not clear where. After nearly a year of studying, soliciting advice and rejiggering, the Seattle Department of Transportation (SDOT) has a new plan for its $930 million levy — the largest in city history — which promised more than it could deliver before voters approved it in 2015. The new plan: SDOT says it can deliver on the vast majority of the 30 “subprograms” included in the levy. But a lot of those subprograms — urban forestry, traffic-light timing improvements and bridge-stairway maintenance, for example — don’t make the heart race with excitement. On the levy’s big-ticket commitments, SDOT is scaling back, trying to deliver as much as possible while dealing with an overheated construction market and less federal funding than the previous overly optimistic projections. In addition to updating the projects it thinks it can complete, SDOT has updated some of its previous assumptions. The original levy assumed $564 million in “leveraged” money, largely from the federal government. The new plan hopes for $525 million, but notes that more than half of that is unsecured. Durkan said that optimistic projection comes from talks with federal officials and other positive indicators, like Sound Transit securing a $1.2 billion federal commitment for its light rail to Lynnwood. “These are the ones that folks at SDOT, working with federal authorities, believe there is a good chance at securing,” she said. The original levy assumed that construction costs would increase by about 2.5 percent annually due to inflation. The actual number, over the last three years, has been double that, with no signs of slowing until 2020, SDOT said. The agency also notes that risks like potential new steel tariffs from the Trump administration have not been factored in could imperil some projects. Some promised projects are only on track because of added funding. The levy, for instance, committed to fixing 225 blocks of damaged sidewalks in urban centers, would be falling short, but Durkan added money in the 2019 general budget to get it back on pace. The big adjustments to past promises are in three areas — street paving, bus routes and bike lanes. Paving projects were divided into two categories: big projects that the city needs outside contractors to complete, and more modest projects that SDOT crews could handle. On the big projects, the levy promised 180 miles of repaved lanes on arterials. The new work plan aims for about 162 miles, dropping, among others, planned repaving on North 130th Street, 35th Avenue Southwest and Northwest Market Street. On smaller projects, the levy included 65 spot repavings every year, totaling 70 miles of repaved lanes. That’s been downgraded to 35 a year and about 45 to 50 miles total. And paving budgets continue to be eaten into by the city’s 2017 settlement of a federal lawsuit that obligates it to build 1,250 sidewalk curb ramps each year. As much as 40 percent of some new repaving projects is spent on curb ramps required by the Americans with Disabilities Act, SDOT said. But the levy’s old plan had SDOT paving 32 miles of arterials this year. Through the first nine months of the year, the agency had paved less than eight miles. SDOT officials note that if they were focused solely on reaching the levy’s paving mileage goals, that could probably be accomplished. But, they say, that would be foolish. Instead they’re including more necessary — and more expensive — projects. About 10 miles of Delridge Way Southwest, for example, will be torn up and repaved with concrete in 2021. Concrete costs about eight times more than asphalt. But Delridge Way also serves a major bus line and is being upgraded to a RapidRide. Buses tear up asphalt roads much faster than concrete. 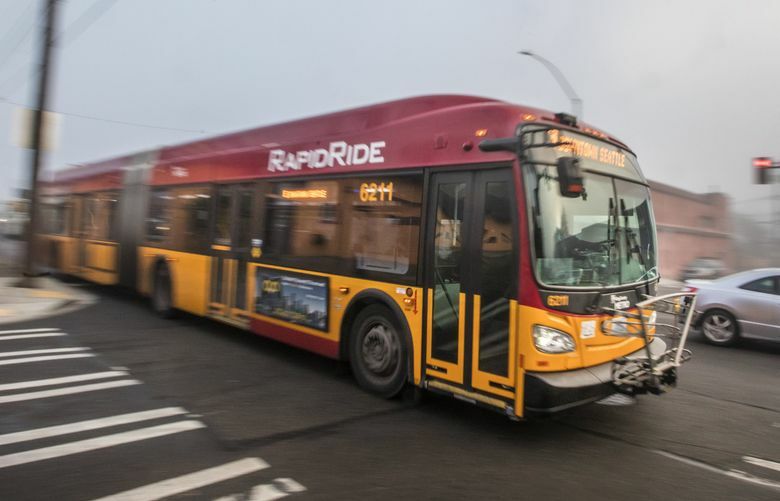 On bus routes, the original levy relied heavily on federal money to deliver promised upgrades to RapidRide status — frequent service, bus-only lanes, off-board fare collection and shelters — on seven routes scattered around the city. SDOT is now confident in completing only three of those — Delridge, Madison Street and along Eastlake (Route 70) — with hopes that King County Metro will fund upgrades on Rainier Avenue (Route 7). The other routes — through Fremont (Route 40), along Market Street (Route 44) and on 23rd Avenue (Route 48), will receive more modest upgrades instead, such as bus lanes only in select spots and bus-prioritized traffic lights. Of the 30 subprograms in the levy, only one lacks a specific path forward in the new work plan: bike lanes. The levy promised 50 miles of protected bike lanes and 60 miles of less costly bike infrastructure. The new plan, which SDOT says will be finished in the spring, will probably complete half of those miles. Bike lane costs can vary, with protected lanes through downtown streets far more expensive than painted or pylon-marked lanes in outlying neighborhoods. But the levy’s initial estimate of an average $860,000 per mile was far too low. Last summer, the City Council unanimously passed a nonbinding resolution calling for a complete network of downtown bike lanes by the end of next year. SDOT, at the time, was skeptical that it could do that. “I couldn’t confidently say we will meet that goal,” Williams said.